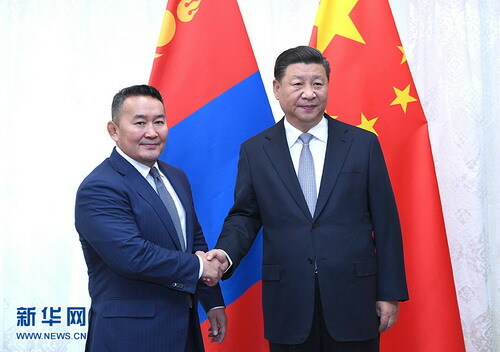 VLADIVOSTOK, Russia, Sept. 12 -- Chinese President Xi Jinping met with Mongolian President Khaltmaa Battulga here on Wednesday on the sidelines of the fourth Eastern Economic Forum. Noting that China always attaches great importance to its ties with Mongolia, Xi said China will enhance exchanges and cooperation with Mongolia and constantly advance the China-Mongolia comprehensive strategic partnership guided by the principle of amity, sincerity, mutual benefit and inclusiveness, and building friendship and partnership with its neighbors. The two sides should strengthen the political guidance on bilateral ties and follow the correct direction of the development of bilateral ties from a strategic height and long-term perspective, Xi said. Noting that the two sides should understand and respect each other's core interests and deepen mutual trust, Xi said China respects Mongolia's independence, sovereignty, territorial integrity, and the development path chosen by the Mongolian people themselves. The two sides should continue to vigorously promote the alignment of the China-proposed Belt and Road Initiative and Mongolia's Development Road program, ensure a leading and guiding role for major projects in bilateral pragmatic cooperation, and vigorously support border regions in expanding exchanges and cooperation, Xi added. The Chinese president said Mongolia is welcome to "board China's express train of development" and share China's reform and opening-up achievements, so as to realize its own high-quality development, adding that China supports Mongolia in developing animal husbandry and processing industry and will import more high-quality farm and pasture products from Mongolia. The two sides should also promote cultural and people-to-people exchanges, so as to consolidate public support for bilateral ties, Xi said, urging the two sides to strengthen communication and coordination in international and regional affairs and jointly promote regional cooperation. For his part, Battulga said that it is Mongolia's unswerving principle to develop stable and friendly ties and mutually beneficial cooperation with China. Mongolia is committed to deepening the ties with China under the principle of mutual respect for sovereignty and territorial integrity, non-interference in each other's internal affairs, equality and mutual benefit, he said, adding that Mongolia adheres to the one-China policy and recognizes that Taiwan, Tibet and Xinjiang are inseparable parts of China. Mongolia is willing to actively participate in the building of the Belt and Road, strengthen cooperation with China in such areas as trade, electricity, farm and pasture, infrastructure construction, and advance the construction of the economic corridor linking Mongolia, China and Russia, so as to promote the common development of the countries in the region, said Battulga.